Gilt head bream fillets stuffed with rocket pesto and served with an aubergine, courgette, peppers and spring onion ratatouille and a sun blushed tomato ratatouille puree. Remove any pin bones from the fillets of bream. For the pesto: peel the garlic and place in a food processor. Add the rocket, pine nuts, olive oil and parmesan and blend to a coarse paste. 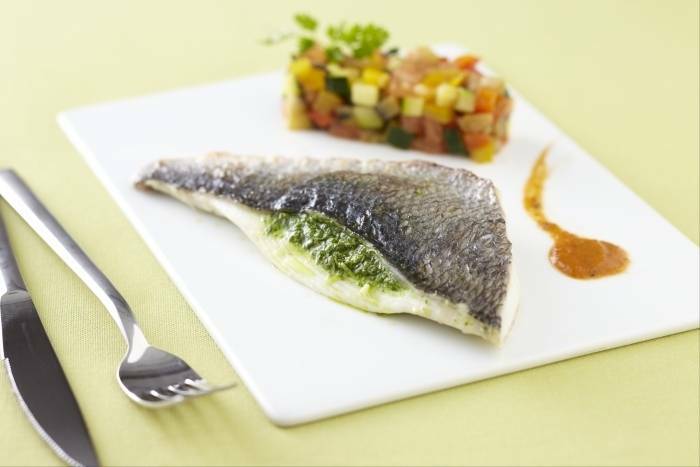 Make a small incision in the thickest part of the bream fillets and then fill with pesto. Place the fish on to a baking sheet and season with salt and piment d'Espelette. Peel the aubergine, peppers and tomatoes and cut into small dice. Remove the outer layer from the spring onions and thinly slice. Cut the courgette into small dice. Add a drizzle of olive oil to a large saucepan. Sweat the spring onions and the peppers with a pinch of salt. Cook for 3 minutes before adding the aubergine and courgettes. Season, add the water, cover and cook for 5 minutes. Add the tomatoes and cook for 3 minutes. Season with salt and piment d'Espelette to finish. Remove 100g of the ratatouille from the pan and place in a food processor with the sun blushed tomatoes and 100ml water. Blend until smooth and then pass through a fine sieve to obtain a smooth puree. Place the bream in the oven and cook for 5 to 6 minutes. Serve the bream alongside the ratatouille. Finish with a drizzle of the puree to serve.